The mere mention of the name “Eucalyptus” in and around San Carlos will conjure up images of holiday lights similar to National Lampoon’s Christmas Vacation, imported snow, massive crowds and what has become known as “Mardi Gras for Kids” every October 31st. Halloween is the opening act for Eucalyptus Avenue as it makes its way into the holiday season. And unlike many opening acts, this one never disappoints. 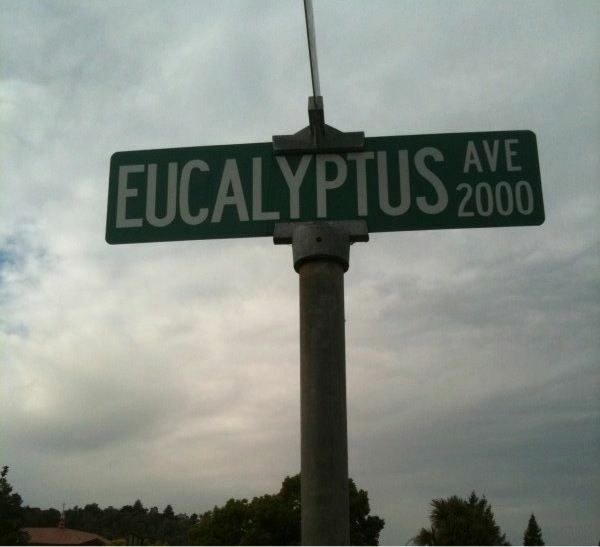 Each year the amount of trick-or-treaters coming to visit Eucalyptus Avenue increases. Families are not just coming from inside San Carlos, they are coming from surrounding communities as well. Eucalyptus Avenue is two blocks long, connecting Tamarack and Orange Avenues. While both blocks are normally shut off entirely to traffic, the center of the 1900 block is where the heaviest action can be seen. Parking is incredibly tight. Your best option may be to park near Burton Park, which is just two blocks to the east. Each year Eucalyptus Avenue seems to one-up itself. Past themes for the 1900 block have included a zombie take-over of San Carlos, an elaborate Pirate theme, a 70’s disco theme which was complete with a bar and disco dancers. As for this year’s theme? You will need to go for yourself and see. * One side note, there is a home on Hall Street in San Carlos which is featuring a haunted house and has been getting some excellent reviews. Anyone with information on this particular home should feel free to post in the comments below. Hey Bob, Thanks for the Eucalyptus shout out. Can you also gently remind folks to be safe, and respectful of the families who live on Eucalyptus? Please stay on the sidewalks (our yards take a beating this time of year) cross at the corners, and, particularly on the early and late parts of the evenings when we are trying to get in and out of our our homes, watch your little ones around driveways. Also the street is not officially blocked off so there may be cars and people should be careful. Just wanted to thank you for mentioning us on your blog. Come enjoy a home haunt for all ages. Measuring approximately 700 ft.² walk through maze that includes live, static, and pneumatic props as well as flashing, strobe and black lights,a laser room,fog machines and more. We are open “Rain or Shine”. Hours this Halloween 6:30-9:30. Cross streets are Old County Road & Industrial. Admission is FREE we do accept donations for local animal shelters. Hope to see you here! Is the Hall street haunted house only open on Halloween night or any nights leading up to Halloween? Would LOVE to check it out!! I would also ask all parents to remind their children not to litter. We do a lot inviting thousands of people in and giving them candy. By definition, all kids are carrying something they can put their garbage in. Please don’t make us clean us your empty candy wrappers. We go to the Haunted house on Hall street every year and they never disappoint .. It really is fun for all ages. Go check it out, you will be happy you did.. The Haunted House on Hall Street is the best! I have been several times throughout the years and every year is better than the last! In fact, we go in a few times because it’s too much to see all at once. Go check it out you will be amazed.